THE DINING room with a large table and 8 chairs, a sofa and sofa bed and occasional tables. The FAMILY room has 2 sofa's, coffee table, ceiling fan, 42" HD Plasma Cable TV, multi regional DVD and CD player. There is a telephone with free national and international calls (USA, Canada & Europe, land lines only) along with free wireless internet access, this room leads to the pool area via alarmed patio doors. The KITCHEN is off the family room and is well equipped with American fridge with ice maker and water dispenser, cooker, microwave, dishwasher, toaster and ample crockery for more that 9 people. There is a breakfast table with 4 chairs. THE BEDROOMS are spacious and all decorated to a high standard. THE MASTER BEDROOM has a king size bed, en-suite bathroom, walk in wardrobes (this room overlooks the pool), ceiling fan, a 32" flat screen TV and multi regional DVD player. There is a crib/cot stored in the walk in wardrobe. THE QUEEN BEDROOM has a queen size bed with built in mirrored wardrobes, ceiling fan and 26" flat screen TV. THE 3RD AND 4TH BEDROOMS are Betty Boop and Toy Story theme twin rooms and have two twin beds in each with built in mirrored wardrobes, ceiling fans and flat screen TV, one has a PS2 console. All bedrooms have side tables and radio alarms. 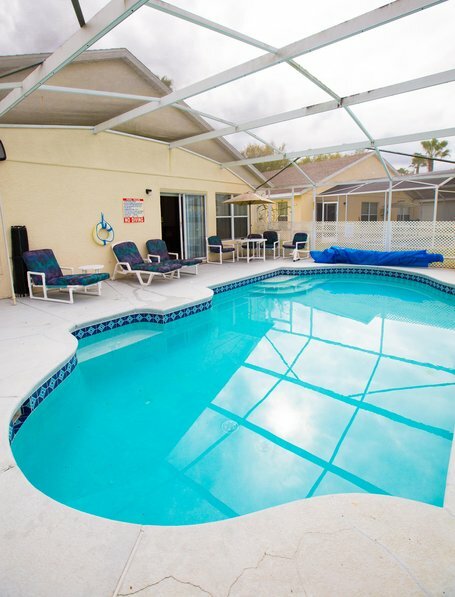 THE POOL and surrounding area is floodlit at night with a large deck and a 28' screened heated pool, with pool blanket and child safety fence. We also have a privacy fence around the pool. There are ample sun loungers and patio furniture. A BBQ is available for rent from $60 per week. THE GAMES ROOM has a pool table, foosball table, electronic basketball and electronic darts. There is a high chair, crib and buggy for your use. The UTILITY room has a washing machine, tumble drier, vacuum cleaner, iron and board, mop & bucket etc. All linen and towels are included (Pool towels also). We have a management company on hand should you require any assistance and there are instructions on all appliances at the villa. We have many restaurants providing a delivery service and have these menus at the villa also. There is a Pubix supermarket down the road and a large Walmart about 5 mins from us on HWY.27 (open 24hrs) With a number of good restaurants a couple of minutes from us at the shopping centre and many more just 5 - 10 minutes away on Hwy 192. There are about 73 golf courses in Orlando many of which are very close by, (Champions Gate less than 10 mins) and rates vary from $15 - $100 including buggy. There are many golf outlets with great year round bargains. The shopping malls are numerous, the Premium Mall on the I-4 is only about 15mins., Florida Mall 25mins. Beltz Outlets and Millenium Mall around 20mins. The renowned Highlands Reserve Golf course is across the road from Hampton Lakes, Champions Gate is 5 mins drive, with many more courses within 20 minutes drive.